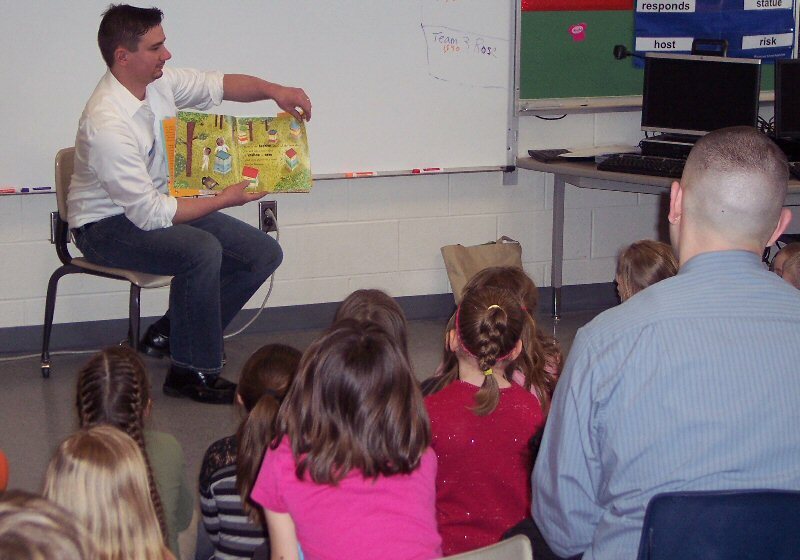 New York Agriculture in the Classroom’s eighth annual New York Agricultural Literacy Week was held in March throughout Oswego County. Community members volunteered to read “The Beeman,” by Laurie Krebs and Valeria Cis, to local elementary classrooms. Ag Literacy Week volunteer Orion Behling reads to a Granby Elementary Class. This book rhyming text and colorful illustrations presented all of the aspects of beekeeping. A young boy tells the story of how his grandfather produces honey, from the clothing he wears and the equipment he uses to the honey extraction process. Not only does this charming book explain the methods of honey production, but it also educates about the various types of bees and how they work together to produce this sweet agricultural product. The book concludes with six pages of additional information about bees, beekeeping techniques and equipment, honey, pollination, and bee dancing. The books were then donated to each Oswego County Public Elementary School, courtesy of Oswego County Farm Bureau. An educator guide was given to each teacher and a lesson conducted during the classroom visits. In addition, honey stick samples were made available to the students courtesy of a Northeast Ag Enhancement grant from Farm Credit East. Agricultural literacy is the basic knowledge about agriculture that all citizens need to make informed decisions impacting careers, health, and public policy. More than 20% of our nation’s workforce is in some way involved in food processing, marketing, distribution, and sales – and all of us eat. NY Ag in the Classroom envisions a day when all students have the opportunity to understand the economic, social, historical, and scientific significance of agriculture to our society; explore food system career opportunities; and recognizes the connection between agricultural production and the daily need for food and fiber products. It is estimated that more than 50,000 students participate in Ag Literacy Week every year throughout the United States. Many organizations and agencies partnered on this statewide educational effort, including NYS Department of Education, NYS Department of Ag & Markets, Cornell Cooperative Extension, NY Agricultural Educators, and NY Farm Bureau.